All of Chris' prints are mounted in a black-core, Porcelain White board and are sold framed and unframed - please see the details below and select the appropriate option when ordering. 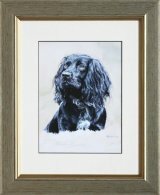 Limited Edition prints are framed in a contemporary, flat moulding with a distressed, silver leaf finish. The size of an unframed, mounted print is 22" x 17.5". 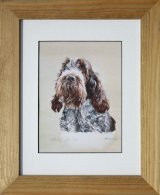 Open Edition prints are available in the distressed, silver leaf frame or a flat, Victorian pine finish and the unframed, mounted print measures 14" x 11". 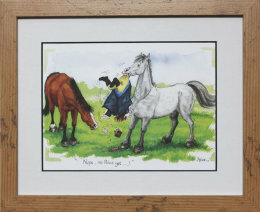 The cartoon prints are all framed in a flat moulding with a light oak finish, as shown below. The size of an unframed, mounted print is 10" x 8".